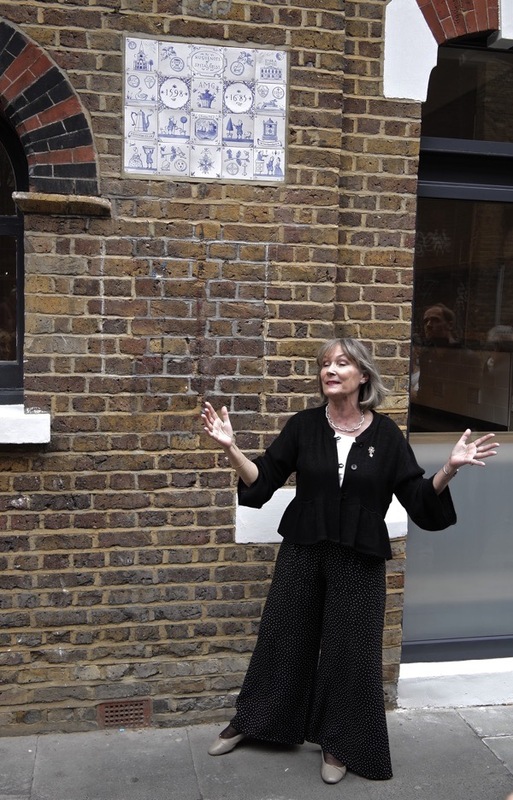 I hope Mavis Bullwinkle will not be too embarrassed if I reveal to you that, of all those who attended the unveiling of the Huguenot Plaque yesterday, it was she whose involvement with the Hanbury Hall extends the longest. Mavis’ uncle Albert was caretaker there before the war in the thirties and Mavis confessed to me that, as child, she remembers performing plays with her cousins on the stage after-hours, when she returned from being an evacuee at the end of the war. 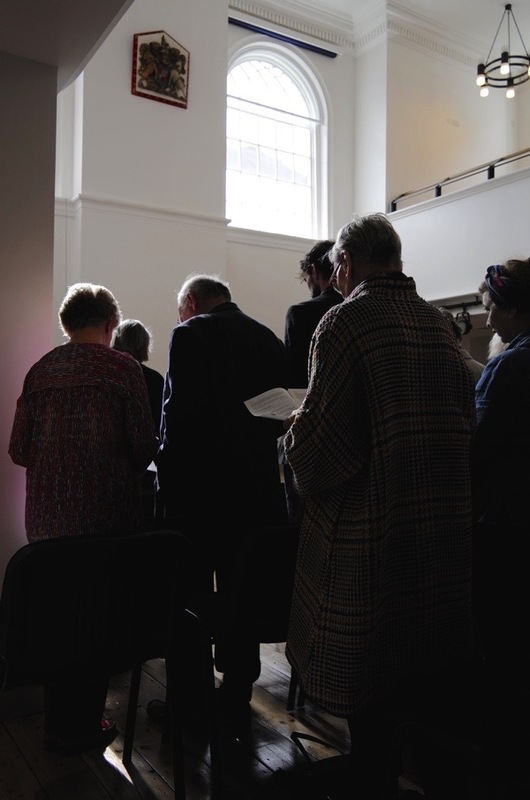 In 1951 at the age of nineteen, Mavis joined the weekly bible class there when her own church, All Saints Spitalfields, was demolished and then she graduated to the role of Sunday School teacher which occupied her each weekend until 1981. 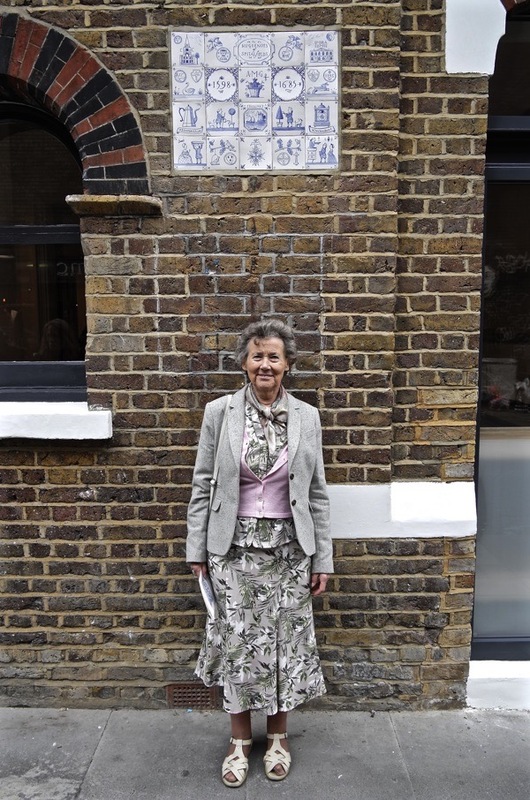 Mavis may not herself be a Huguenot but, as a local resident for more than eighty years, she has come to embody a certain continuity in the neighbourhood and her generosity of spirit is emblematic of the best tradition of Spitalfields. As you can imagine, there was no shortage of Huguenot descendants yesterday to remember the quarter of a million refugees who came to Britain in the seventeenth century and, in particular, the twenty thousand who came to Spitalfields. The Hanbury Hall was originally built as a Huguenot Chapel in 1719 then extended to the street and converted as a church hall for Christ Church in 1887 and now has been newly restored with flats on the top. 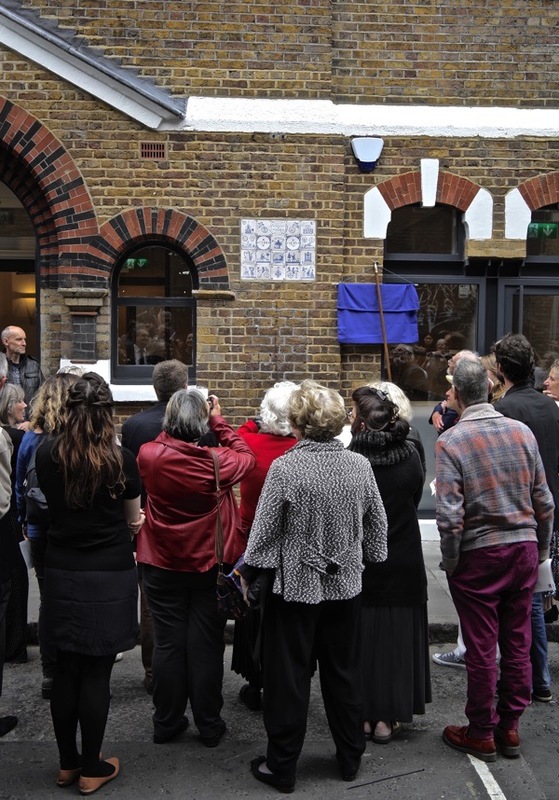 Yesterday’s unveiling of the plaque was the culmination of three years of Huguenots of Spitalfields festivals organised by Charlie De Wet which were attended by more than twenty thousand people and the plaque of twenty Delft tiles designed by Paul Bommer is the legacy of this project. 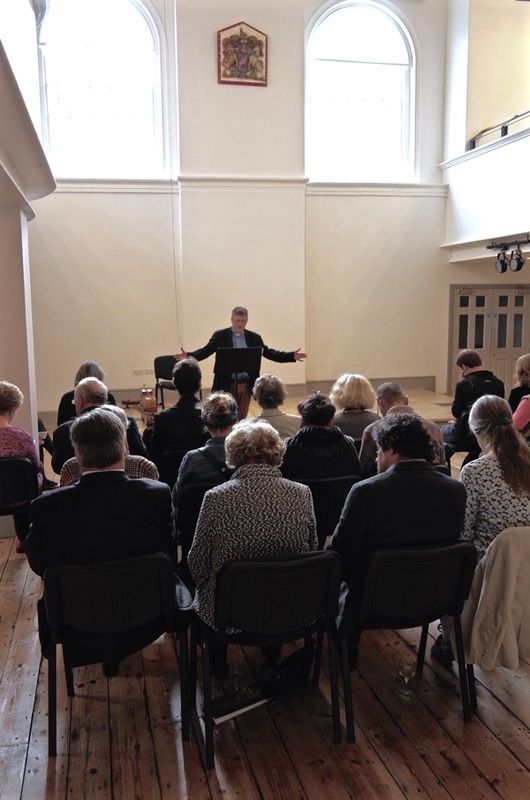 As we all sat in the three hundred year old hall and listened to the story of the Huguenots, how they fled their home country in fear of their lives, of the refugee camps that were created here and of the charities that raised funds, the parallel to the contemporary crisis became inescapable. 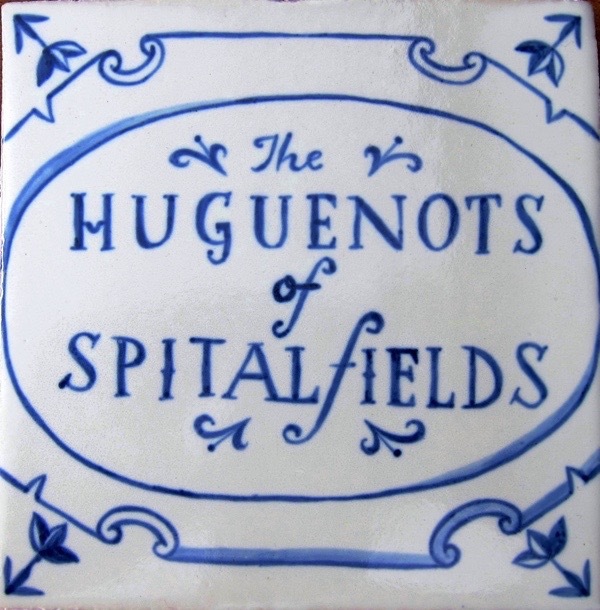 At the conclusion of the three year Huguenots of Spitafields festival which has brought light to the unexpected contributions of the Huguenots to British society, I think we all recognised that as one story ended another was just beginning. The Huguenot Plaque is amazing: colorful, enlightening, and whimsical. I saw the restored Hanbury Hall yesterday and it’s magnificent. And now it has flats on the top, even better. 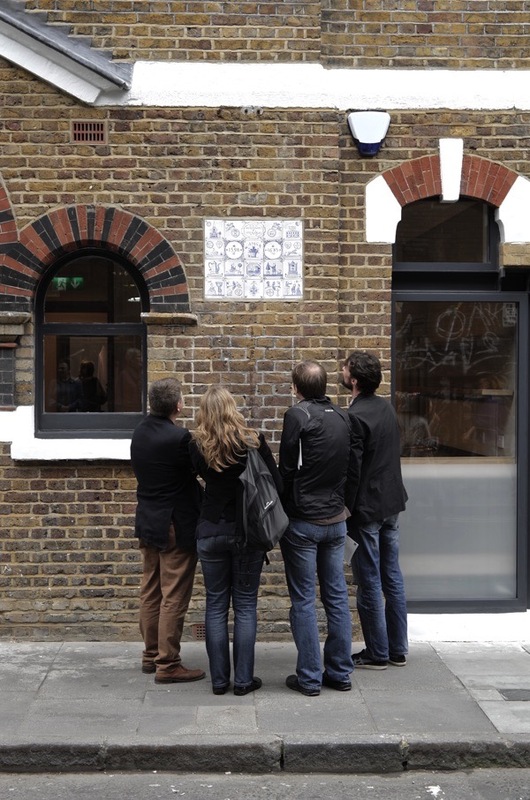 In 300 years time maybe there’ll be another plaque near Paul Bommer’s celebrating The Syrians of Spitalfields and telling their story of immigration, integration and contribution. Hello, I regularly subscribe to the emails from your site but for some reason seemed to have missed the date of the unveiling, I am honestly really disappointed to have missed this as I am writing a book about the Huguenots and a large part of the book will be based in London primarily Spitalfields, Bethnal Green and Wandsworth. 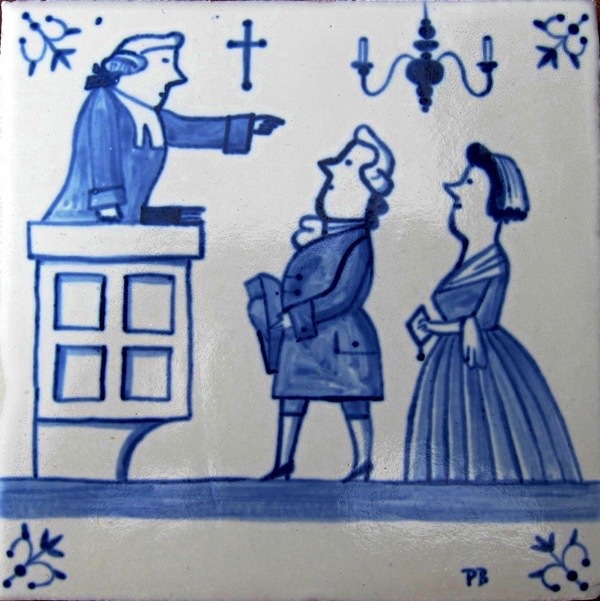 I am a fellow of the Huguenot Society, having joined a couple of months ago. 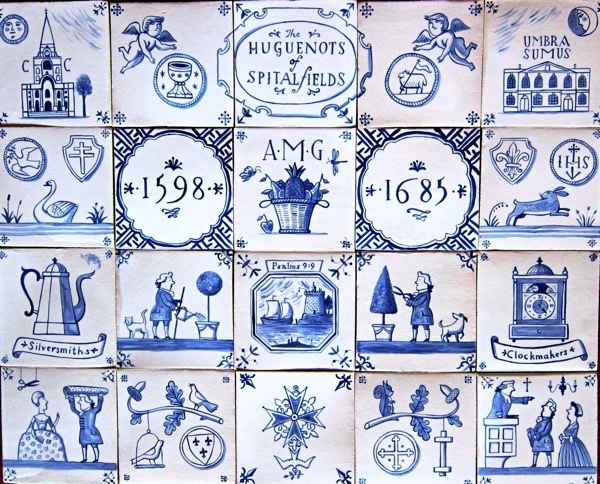 I do hope I can attend any further Huguenot events as my family are of Huguenot descent and I am very proud of this. Thank you for doing this. I wish I could have been there! My Colonial ancestors were Spitalfields Huguenots and I am proud of that legacy of faith and hard work they passed on to their descendents. Bless all of you and thank you, again. Glad I was able to be there and I thought the service was excellent. Keep the Faith!! What wonderful history you have to celebrate in Spitalfields. Paul Bommer’s commemorative plaque is a visual delight. I was so pleased to be at this Dedication, to think my ancestors might well have worshipped here. So glad I did not miss the day, it was very special to me and I will never forget. 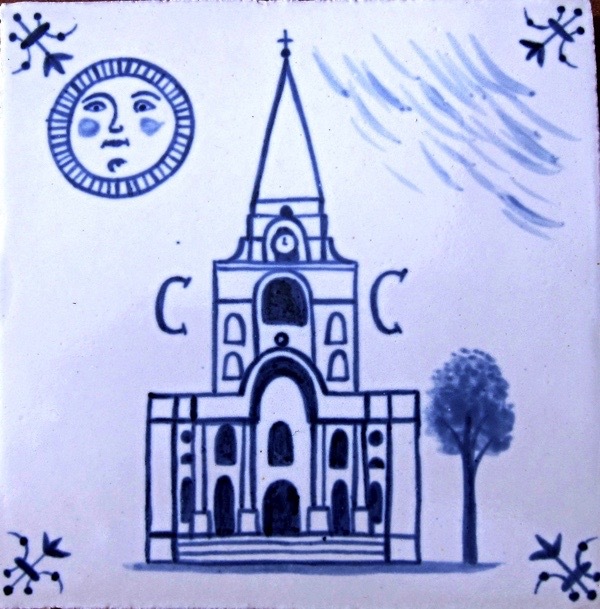 The tiles are beautiful and will still be there when I am long gone! I have had a wonderful summer thanks to Charlie discovering so much about my ancestors. 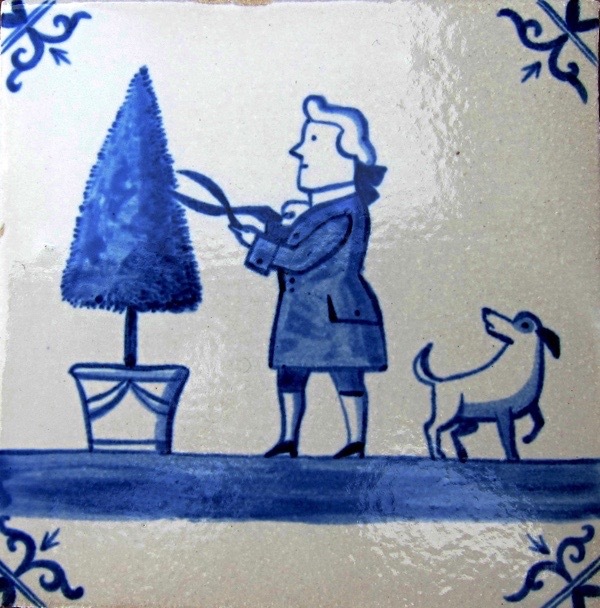 I love Paul’s tiles in this wonderful series! I understand they’ve been sold out for years. Does anyone have any they’d be willing to sell? I’d particularly like the gardening and dressmaking designs. Thank you!